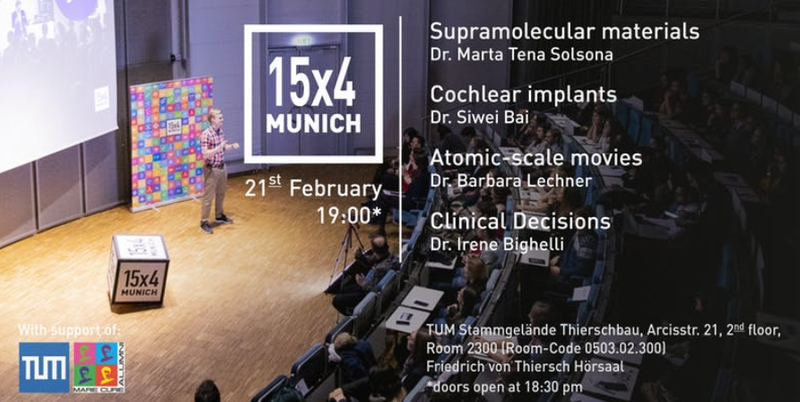 Come to TUM on February 21st at 7pm to learn more about science - completely free of charge.15x4 is a series of science communication events initiated by young scientists and enthusiats. Enjoy four 15 minute presentations on the topics of Medicine, Atomic video, Cochlea and Supramolecules with subsequent Q&A sessions. Friedrich von Thiersch Hörsaal, 2nd floor, (Room-Code 0503.02.300).